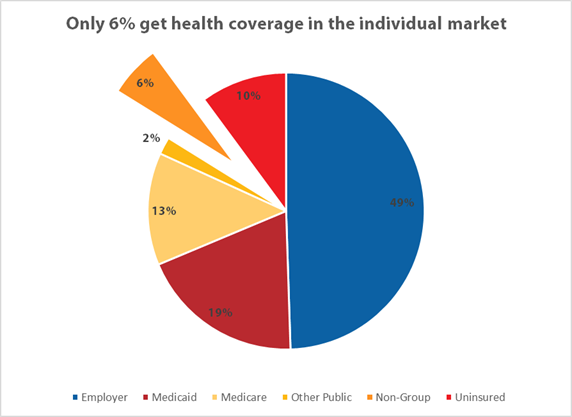 Context alert: Only 6% of those with health coverage get it through the “individual” market. Every morning these days I’m greeted by front-page articles explaining how Obamacare is seriously broken as private insurers are abandoning the exchanges. No question, that’s an important problem for the individual, or “non-group” market, though one with many good solutions (I’ll provide links in a moment). But anyone who makes this point should also be required to make this other point: only 6 percent of health care coverage is provided through the non-group market. About half of those with coverage get it through their employers, another third through public sources, leaving about 10 percent without coverage, down from 13 percent a few years ago (see figure below from the Kaiser Family Foundation; these data are for 2014; the uninsured rate fell another point in 2015). Neither the Post nor the Journal made this point, and my concern is that its omission leads too many readers to assume that the thinning of providers in the individual market is a fatal flaw as opposed to a manageable problem amenable to fixes. –Henry Aaron’s idea to “Make the Obamacare exchange one big marketplace for everyone buying individual health insurance coverage. Nationwide, this would merge the 12 million people who get their insurance through Obamacare with the roughly 9 million who buy their policies outside the exchanges.” To be clear, you’d have to do this state-by-state, requiring that any plan sold in that state’s non-group market had to be sold through the exchange, so this is obviously a heavy lift in practice (so far, only DC and Vermont take this approach). But Aaron’s idea gets at the heart of the problem, which is expanding the “risk pool” within the individual market to avoid adverse selection problems that have been costly to private insurers, who priced too many of their products for a healthier pool than the one that showed up. My colleague Sarah Lueck offers good ideas on how to make needed risk-pool adjustments. All that said, my key point here is one of perspective. Without context, a 6 percent problem gets inflated to be far more consequential for the ultimate success of Obamacare than it really is. Share the post "Context alert: Only 6% of those with health coverage get it through the “individual” market." 4 comments in reply to "Context alert: Only 6% of those with health coverage get it through the “individual” market." Allow individuals to buy into Medicare regardless of age. Problem solved. Yep–I’ll old enough to have been a big fan of Ted Kennedy’s “Medicare for All.” At least lower the age of eligibility. The problem with “buy into Medicare” “problem solved” approaches is that they seldom come combined with the actual premium that would be required. I am always afraid that people think this would just mean paying a 3% or so payroll tax plus a Medicare Part B premium rather than understanding that their current payroll tax is already needed to pay for Part A for others and would not in any case be sufficient to pay for their own Part A. Or that the Part B premium only pays for something just over 25% of Part B. That is if we assume that current workers 55-65 continue to pay FICA for Part A for those over 65 then they are faced with paying the full freight for Parts A, B and D. Or are proposing that the Feds pick up their current General Fund share for that portion of Part B NOT covered by premiums. Which is to say that buy in would not be cheap. To the point that for the targeted population it would likely not be affordable. Are all these people really prepared to pay $500-$700 a month plus cost shares? Or what are the numbers? In point of fact examination of past “Medicare for All” bills so called, whether that be Conyers-Kucinich or the iterations of Kennedy-Dingell before that call for a NATIONAL buy-in to something that doesn’t much look like current Medicare. Instead they look (and especially Conyers-Kucinich) a lot closer to the British Single-Payer model (pre-Cameron/Osborne anyway). Not that there is anything wrong with that. I am all for Single Payer. But lets not fool ourselves that a simple way station towards that is simple “buy into Medicare”. Because that is not simple at all. And much more expensive for the individual that anyone currently seems to believe. We might also find a way to make use of a national exchange, one that already operates, works well, and provides coverage to several million people – the Federal Employees Health Benefit Plan (FEHBP). This is a national exchange with a plethora of plans running from Blue Cross to local HMOs. Federal Employees, retirees and their dependents pay about 30% of their premiums with the agency paying the balance. Start with the 30% figure and apply the current Obamacare subsidy formulas to the balance. Yes the additional risk pool is likely a bit sicker than the pool insured by the current exchange but part of that could be overcome by strengthening the mandate. One advantage to a national exchange is that coverage applies across state lines – something that isn’t necessarily true of current PACA offerings if the Blue Cross plan a friend of mine has through the PACA exchange is an accurate example (she lives in NC). A disadvantage to FEHBP is that it’s plans currently do not require Medicare eligibles to sign up for Medicare and use that as first coverage; therefore FEHBP doesn’t offer supplementals which makes its premiums a bit higher than necessary. I report on postal issues and this one aspect would make a significant difference with respect to the retiree health funding (GAO found most of the liability would disappear if this was fixed). NARFE has short sightedly and selfishly opposed this fix although it makes sense since Federal employees and their agencies pay into Medicare. I suppose NARFE and others would oppose the use of this solution but a national exchange that exists and works well makes sense for PACA individual markets. There is also the valid argument that extending the same coverage to all Americans that their Congress-critters get (and the Federal employees and retirees who serve all Americans get) has an element of fairness. Since one goal of Republicans has been to undermine FEHBP using it as a national exchange (or “public option”) might have the effect of solidifying general support for the program. Fixing PACA is both a technical and political problem but it isn’t like we don’t have available solutions. Early buy-in to Medicare, fixing the Medicaid provisions that John Roberts rewrote, using an available national exchange to expand and extend the risk pool, and addressing the intellectual property problems that allow drug companies to raise prices without any respect to reality or costs are all reasonable and doable steps that would bring affordable coverage to all Americans while also moving towards addressing the most important element of our healthcare problem – costs that far exceed those of other countries while yielding little or no benefit.